Research Interests: Aquatic Ecology; Global Change; Paleolimnology; Eutrophication; Climate Change; Biodiversity; Lake and Watershed Management; Aquatic Conservation. Felipe now works for the Office of the VP at McGill in the Research and Innovation Office. Katrine is now an Assistant Professor at UQO. Alex is now doing a PDF at the University of Wisconsin-Madison. Daniel is now a limnologist with the Dept. of Fisheries and Oceans Canada at Cultus Lake, BC. FQRNT PDF awardee, co-supervised with Dr. L. Chapman. (on maternity leave 10/2009 – 06/2010). 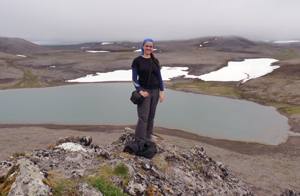 Emilie is now a consultant working with researchers at the University of Alaska Fairbanks. PhD Thesis: Reconstructing macrophyte biomass dynamics in temperate lakes of northeastern North America using paleolimnology. Jesse did a FQRNT-funded post-doc at Carleton University with Mike Pisiaric. Jesse is now Assistant Professor in the Institute of Environmental Science at Carleton University. PhD Thesis: Historical and contemporary drivers of cyanobacterial dynamics: regional and global perspectives. Zofia is now doing an FQRNT funded post-doc with Dr. Pierre Legendre. Alex Crew - MSc thesis. Quantifying microplastic dynamics and distributions in the St Lawrence River. Alexandre is currently working as a research assistant in the Ricciardi Lab. Michelle Gros - MSc thesis. Food web responses to winter water level drawdowns in temperate reservoirs. Michelle is currently working as a research assistant in the Gregory-Eaves Lab. Jennifer Barrow - MSc thesis. Functional and taxonomic phytoplankton community responses to macrophyte abundance and nutrient loading in experimental ponds. 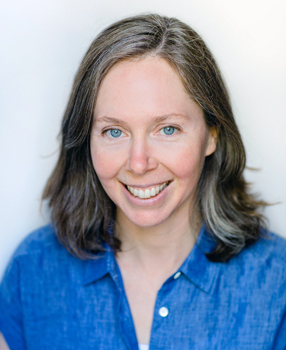 Jennifer is currently teaching in Montreal schools and CEGEPs. Leanne Elchyshyn - MSc thesis. Evaluating the impacts of damming and water level drawdowns: a paleolimnological study of long-term water quality trends in reservoirs. Leanne is currently working as a research assistant in our lab. 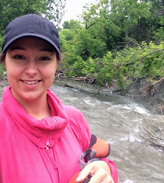 Gabrielle Trottier - MSc thesis: Evaluating the impacts of winter drawdown on macroinvertebrate communities within the context of localized environmental conditions. 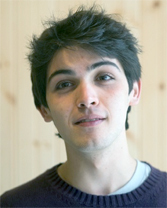 Co-supervisor: Christian Nozais, UQAR. Gabrielle is now working on her PhD at Ecole Polytechnique under the supervision of Manuele Margni. 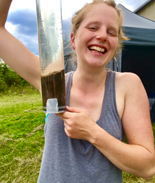 Katherine Velghe - MSc thesis: Quantifying biodiversity in aquatic ecosystems: evaluating the causes for congruent patterns across trophic levels. Katherine Velghe is now a research technician at the GRIL - UQAM. 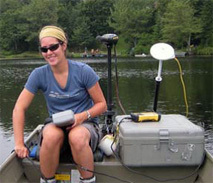 Marie-Helene Greffard - MSc thesis: Chironomids as indicators of environmental change in northeastern North American shallow lakes. 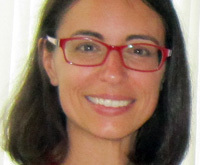 Marie-Helene is now doing her PhD with Pedro Peres-Neto. Zofia Taranu - MSc thesis: Tracking changes in water quality due to catchment land-use and lake morphometry across spatial and temporal scales. Zofia is now doing her PhD in my lab. Emmanuelle Chretien - BScH thesis: The effect of eutrophication on food chain length in aquatic invertebrates: a field survey. 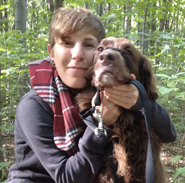 Emmenuelle is now an MSc student in Dr. Lauren Chapman's lab, Department of Biology, McGill University. Holly Stewart - BScH thesis: Zooplankton community responses to salmonid introductions in Alpine lakes: A case study of Lone Lake. Saskia Nowicki - BScH thesis: Regulatory factors of eutrophication in small, temperate lakes: a study of five eastern Quebec lakes on a total phosphorus gradient. Katherine Velghe - BScH thesis: Long-term ecological dynamics in sockeye salmon nursery lakes. Marc Richard Albert - BScH thesis: Assessing the response of Cladocera to nutrients and related ecological changes over spatial and temporal scales. Lauren McGruthers - BScH thesis: Testing the Feasibility of Tracking an Alewife-Derived Nutrient Signal in Lakes from Coastal Maine, U.S.A.
Holly Embke - The effects of varying water level drawdown on macroinvertebrate communities. 6 credit project. Matt Moccia - Does ephippium length predict planktivory pressure in Quebec lakes? 6 credit project. Jordanne Gray - Cell volume approximation as a measure of cyanobacteria biomass. 3 credit project. Guillaume Pelletier – Effect of primary productivity on invertebrate food chain length in shallow lakes. 9 credit project. Katrina Adams – A paleolimnological study of Baptiste Lake, Alberta. 6 credit project. Amy Blaser – Water is life – a public outreach display funded by the McGill Sustainability Project. 3 credit project. Tanya Tran – Testing paleolimnological indices of fish predation pressure. 3 credit project. Mary Schroeder - Vegetation change and water quality. 6 credit project. Tyler Hunt - Sediment diatom composition of Green Bay, Lake Memphremagog and the application of a transfer function to infer past environmental conditions. 6 credit project. Claire Moore-Gibbons – A paleo-experimental test of the response of chironomids to changes in hypolimnetic oxygen: A case study from Amisk Lake, Alberta. 6 credit project. Soren Brothers - A multi-scale analysis of factors affecting changes in lacustrine sedimentation rates. 9 credit project. Jessica Hawryshyn - Within-lake variability in chironomid sub-fossil assemblages in southern Ontario: a multiple-core study. 3 credit project.